Built around 1991 by Stockholm based luthier Jack Wahlberg. Swamp ash body by Warmoth, quartersawn maple/rosewood neck by JaWa (strat heel, tele peghead) with Dunlop 6150 fret wire. The fretboard inlay at the 12th fret is real mother-of-pearl, taken from the thumb grip on Jack’s fathers’ violin bow. Jack thought it would give the neck a nice personal touch… The guitar was originally built around the late ‘80s Valley Arts/Tom Anderson ideal – tilted neck, gold Floyd Rose, ditto Gotoh tuners and Ultrasonic HSS pickups. Actually, to be honest I wanted it to feel like an ’86 Kramer Pacer I once owned, which is why it had the tilted neck instead of a recess for the Floyd. 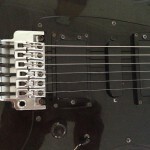 I later tried a Tele bridge pickup, which required even more modifications to the route. This time I was able to Dremel out some wood below the top edge (leaving a lip so if I eventually were to fit a humbucker mounting ring it wouldn’t show up). Sure enough, by 2010, I’d gone back to a bridge humbucker (a Tom Anderson H2), and later installed a set of DiMarzios – two DP408 (Virtual Vintage 54 Pro) and a DP191F (Air Classic Bridge). At the same time, I re-did the electronics with a fresh 5-way switch and two Bourns pots. I went with 500K pots (since the H2 had felt too dull with the 250K pots that were in the guitar at that time), but of course things got too bright… It seems that the DiMarzio pickups work fine with 250K pots – even the Air Classic humbucker – so I tweaked the volume pot to lower its value. So now it has a 250K volume (288K to be precise :)) and a 500K tone. 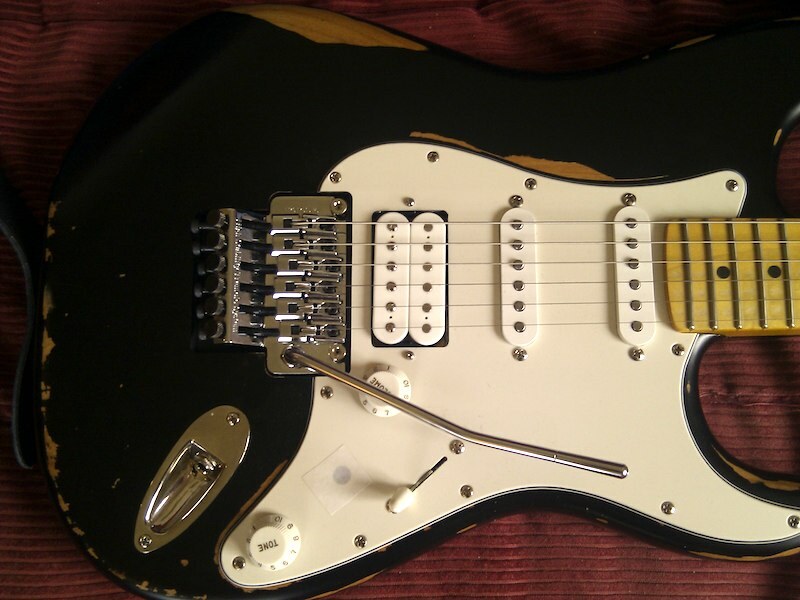 The pickups have since been changed again – I took the Fender Robert Cray neck and middle single coils and Harmonic Design Z-90 bridge pickup out of the Charvel (mentioned below) and stuck them in this one instead. The Dimarzios went into the Charvel. This guitar is very bright and punchy in the upper-mid region, due to the construction. The neck isn’t secured with regular wood screws, like other strats. It actually has metal threaded collars sunk into the neck (underneath the fingerboard), and uses fine-threaded bolts to ensure a tight fit. It works like a dream, and as a result, this guitar has the most ”active” (as in vibrant) neck I’ve ever experienced. On top of that, the body is made from a very lightweight and resonant piece (two pieces, actually – the two parts are glued together right below the pickup routs) of swamp ash. Can you say ”TWANG”? As with all my 25.5″ scale guitars, I’m running 010-046 strings, either GHS Boomers or Elixir Nanowebs. One day one of the staff at Estrad (now 4sound Folkungagatan Stockholm) showed me this guitar that had come in a trade deal – he was thinking about buying it, and wanted to show it to me. It had a crack in the body around one of the bridge screws that let the bridge flop around a bit, and IMO really crappy pickups. We both recognised its potential, and a problem arose: we had fallen in love with the same guitar… Later that day, I took a cheap shot and played the ”I’m the customer” card… apparently customers’ wishes supercede those of the staff. (Sorry, Leffe. Still friends?) Anyway, with that settled, Estrad’s then guitar tech Jörgen Bergerstedt – one of the best guitar techs, and nicest people, I’ve ever had the pleasure of meeting – fixed the crack with a piece of hardwood and set the guitar up. It played like a dream. It has a standard replacement body (one you’d get from WD, Allparts, Chandler etc) with unknown body wood, and a birdseye maple telecaster neck. The pickguard I think has a “Chandler” sticker on it – but that’s the only identifiable part of the guitar… The pickups are Fender Texas Specials, with a Fralin Baseplate installed on the bridge pickup. It’s a slightly strange guitar – its sound isn’t very well-defined in the upper mid region, but it sounds positively awesome with the Texas Specials in it. With fresh strings on it’s a killer guitar, but somehow the tone loses its body quicker than usual – like the strings die faster on it… One of these days, I will replace the bridge for a Wilkinson vintage-style unit. It has a Warmoth body in swamp ash, painted in pewter (a semi-dark grey metallic) with a maple/maple Charvel Japan neck with Grover tuners (from a Pro Mod San Dimas) and an original Floyd Rose. It’s a really resonant and ”alive” guitar, which is just how I like them. As such, it quickly relegated the ESP/LTD to backup status. The pickups that came with the guitar (Fender Robert Cray neck/middle single coils and a Harmonic Design Z-90 [P-90 in a humbucker-sized housing]) went into the Wahlberg, while the Dimarzios I took out of that guitar went into this one. So now it has the same pickup configuration as the ESP/LTD below (Virtual Vintage 54Pro for neck/middle and an Air Classic in the bridge). The neck came off an RG440 (the HSS model), but the necks were the same across the 1986 RG4xx guitars, so it fit right in. I’ve polished the frets and cleaned/oiled the fingerboard, and that’s it. 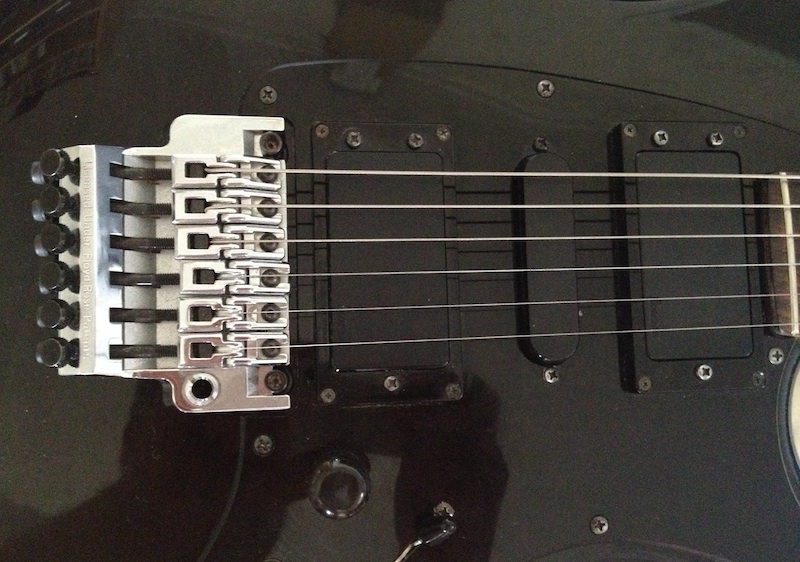 I needed a bridge for it – ideally it should be a chrome original Ibanez Edge, but those are getting expensive. 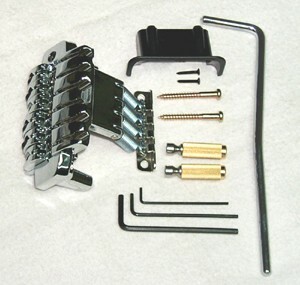 I’m currently using a chrome Gotoh floyd that I originally used on the ESP/LTD. The Gotoh and Ibanez Edge are quite similar both in appearance and feel, so it works ok. Pickups are from Tom Anderson – a H1- in the neck position and H2 at the bridge. The stock pickups and electronics of course reflected the guitar’s purchase price, and didn’t last. I went for Dimarzio Virtual Vintage 54 Pro’s in the neck and middle position, with an Air Classic bridge humbucker. The stock 5-way switch felt really flimsy and was a bit intermittent in the middle position, so it was replaced for an Oak switch with a Callaham ’60s style switch knob (I very much prefer the stubby kind over the tall/pointy switch tips used on most Far Eastern guitars). 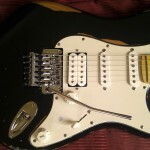 I also moved the volume knob up to the stock Fender strat position (that’s what I’m used to, after all) and changed the volume pot value to 250K, to better fit the new pickups. It’s a cheap and cheerful guitar, which actually swings quite a bit above its weight. Even so, it doesn’t see much use these days. Aside from a non-standard output jack (which has since been replaced for the correct type), the guitar is completely original and only seems to have a few dings and scrapes. The colour is pearl white – think of it as white with a slight reddish/pink hue that comes out at certain angles, while in some angles and light conditions it turns mint green/parchment. It used to have a Tremsetter, but it has been removed at some point (I don’t remember if my original guitar had that contraption – if it did, I must have removed it too, as I used to pull the bridge quite far back :)). The factory had installed one of the tuning pegs a little wonky, so it was tilted a tad forward. I quickly took it off and filled the hole with toothpicks and super glue. A sharp knife later, the hole was effectively gone, and I could then drill a new pilot hole in the correct location. The bridge pickup is a Seymour Duncan JB (marked ”JBJ”, which I’ve found out means it was wound by Maricela Juarez), while the neck and middle pickups are Seymour Duncan APS-1 single coils. The guitar has three micro switches (on/off for the two single coils, and split/off/series for the humbucker), as well as a fourth switch that selects the bridge pickup in series mode. The sole volume control is a 500K pot with a treble bleed capacitor, which makes the single coils very bright. When I received the guitar, the bridge pickup wasn’t correctly wired, so I ended up re-doing most of the internal wiring to bring it back to original specs. I did disconnect the treble bleed capacitor, though, and lowered the volume pot value to about 300K to take a little edge off the single coils. It did however make the humbucker a bit too dull… So I’m trying another approach – I’m going to put the pot back to 500K and reconnect the capacitor (to help the humbucker breathe a bit), while adding resistors to the single coils to simulate a 250K pot when they’re in use. Yup, another trip down memory lane… I used to lust for these guitars back in the day, and some 27 years later I found one for cheap right here in Sweden. It came all complete, except for the case and tremolo arm, in really good shape with stock pickups, untouched wiring and all. The 450 came with two IBZ humbuckers and a Super 7F single coil in the middle position, and for some strange reason Ibanez chose not to hang the humbuckers from the pickguard as you’d normally do. Instead, they used pickup surrounds, which screw through the pickguard and into the body. So that’s 8 more screws holding the pickguard in place, and when you lift the thing out to do some soldering work, the humbuckers need to be taped to the pickguard to stop them falling out of their holes… Annoying stuff. Anyway, I gave the guitar a quick once-over – which didn’t take long, considering the great shape it already was in (just look at that bridge!) – cleaning the guitar up, polishing the frets and adding some lemon oil to the fretboard, the guitar both looked and played really well. There’s even plenty of fret life left. Plugged in, the guitar sounds really good – the pickups are maybe a bit bland, but better than I remember from back then. I have sourced a new tremolo arm (Ibanez still makes them) and found an original case for it. So now it is complete. I mentioned earlier that 1986 was the first year with the Edge tremolo and the last year with the old style headstook. This is another transitional piece, it seems. It has the pointy style head (flat rather than angled), but the neck shape is still a fair bit thicker than the later necks – I’d say it’s somewhere between the 1986 shape and the newer ones introduced with the JEM777 (in 1987) and the following RG series (from 1988 onwards). It also has a different pickguard shape (more strat-inspired) than the earlier Roadstars, making it quite easy to identify as a 1987 model. It’s funny how moving to a different type of guitar affects your playing – I find myself playing completely different lines, in a completely different manner, on this guitar than I do on one of my strats. And there’s something very special about the tone of a semi – there’s a nice ”space” around each note that you just don’t get with a solid guitar. The guitar is strung with 011-049 Elixir Nanowebs. If I were to improve anything, it’d probably be the pickups. But knowing how involved a pickup change is on a semi-hollow, time will tell. Another cheap Ibanez semi-acoustic, this time in a sort of strat-shape with a tremolo. This guitar was made in China in november 2004 and has a bubinga top with maple sides and back (it remains to be seen whether the bubinga is solid, or if the top is laminated). The neck is stated to be mahogany/maple, but I don’t know which part is which. The fingerboard clearly doesn’t look like maple, but could it really be mahogany? I have to say something about the tremolo too – it’s called the Ibanez ACT, and is specially designed for center block semis. The springs are much shorter and fit underneath the bridge itself, so you don’t have to rout out a big cavity in the back for them. It is a neat design, but inititally I didn’t get to try it out much, since the tremolo bar was missing when I bought the guitar. I started looking online, and quickly found out the part number. I also quickly found out that the only places that sold these wanted insane amounts (shipping included) for them. Then my local music store (4sound Uppsala – hi!) placed a quick call to the excellent Swedish Ibanez importer Crafton, who quickly found one in their parts bin. Internet doesn’t always win… Anyway, as I suspected, the tremolo lends itself more towards Bigsby-ish slight warble than divebombing, and as usual the G string tends to snag up at the nut. So maybe I’ll end up with a Graphtec nut on this one too (like on the Hamer). This one is from the XT series, so it’s one of the cheap ones – a ”real” Hamer Studio Archtop would cost ten times as much as this one did. It has a mahogany body with a cream bound flame maple top and mahogany neck. It is surprisingly heavy for its size, and while it balances ok when standing up, when sitting down the guitar body is constantly pulling itself to the right and towards the floor. I would love the guitar to be chambered, both for weight and tone purposes, but I’m not too keen on the idea of removing the top to do the routing 🙂 The Wilkinson tremolo itself works just fine, but the stock nut kept pinching the D and G strings, pulling them sharp whenever the tremolo was used. I replaced the nut for a Graphtec Black Tusc XL, which fit right in after a little sanding to get the height right. Its shallower slots help the guitar stay reasonably in tune. It’s not perfect, though – since the headstock wasn’t designed to let the strings run straight to the tuners (look at a PRS, and you’ll see what I mean), the D and G strings have a quite marked sideways pull. While the new nut has helped tremendously with keeping the guitar in tune, ideally I’d like to find some roller string guides that work ”sideways” (for lack of a better term), which would make the D and G strings run in a straight line over the nut. 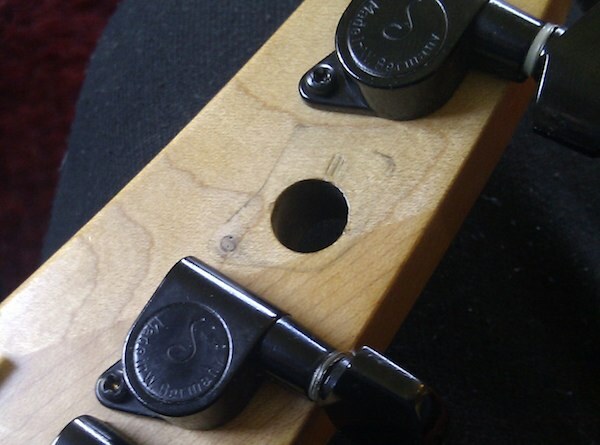 Also, the locking tuners could be better – they lock the strings just fine, but tuning comes with a quite vague feel. The new nut helped here too, but a higher quality set of tuners wouldn’t go amiss. Though it should be said that it is still a surprisingly good guitar, especially for the money. I bought the guitar intending to get more and more into the humbucker/Gibson-scale sound, but still don’t want to have make too many adjustments when using one of the strats. So I tend to gravitate towards the lower output humbuckers. The stock ”Duncan Designed” pickups were ok, but only just. 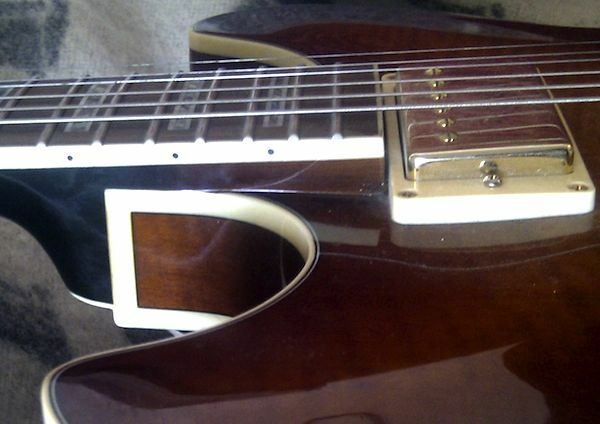 I also didn’t like the look – nickel covered pickups with black surrounds didn’t work for me. The guitar now has a set of Dimarzio 36th Anniversary PAFs, and while at it I also replaced the pickup surrounds for cream items. I’ve also rewired the controls – even though I could see the benefit of being able to adjust the timbre of the middle position, having separate volume controls nearly drove me nuts. I kept reaching for the closest pot (which controlled the neck pickup), thinking it’d turn the volume off. Not so nice when you’re on the bridge pickup with raging distortion… Now, the first pot (closest to the picking hand) is a master volume, while the middle pot is disconnected. I’m thinking of turning it into a variable split control for the neck pickup – the modding bug keeps itching… 🙂 The guitar is strung with 011-049 Elixir Nanowebs, which suit the shorter scale (24 3/4″) well. I put a candy apple red Tokai strat up for sale, since I really needed the cash (and besides, I wasn’t really using it anyway). Naturally, instead of people lining up to buy the guitar, I got a trade offer I couldn’t refuse… This is a Warmoth Telecaster (despite the Fender logo on the headstook), sporting an alder body with an oiled walnut top. The neck is Warmoth’s standard thin shape, which is basically a sleek ’63 strat C-shape. The compound radius (10″ at the nut, gradually increasing to 16″) fretboard has Dunlop 6150 frets, and the whole neck is made from birdseye maple. 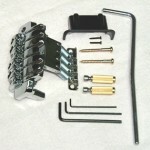 It also has the Gotoh side-adjuster – a fine-tuner for the truss rod, so you can adjust the neck without taking it off. The bridge is a beefy Gotoh flat (yes! no ashtray!) six-saddle version, and the tuners are locking Schallers. The guitar is currently sporting an EMG T-Set (alnico) with volume, tone and SPC presence (mid boost) control and a three-way switch mounted in strat-style fashion. For some reason, I’ve always wanted to try the EMG Tele pickups. Don’t ask me why, but now I have, and they’re quite good! The SPC control lets me dial in some midrange honk, when I want to, and the tone control works beautifully to adjust the very top end. I often run it with the SPC just barely on, and the tone rolled off just a touch. One thing about the EMG’s – if your Telecaster has a pickguard, it probably also has a relatively large neck pickup rout. My guitar, though, had a really tight neck pickup rout, and the EMG neck pickup didn’t quite fit. I ended up widening the rout a tad, and also (very carefully) grinding a little off the pickup’s edges as well. I ordered this guitar from an online retailer in Germany, having only seen the pics and read a review in Guitarist magazine. It turned out to be so cheap (it’s a Korean Epiphone, after all) that I figured I’d be easily able to sell it and recover my costs if I ended up not liking it. But I did have a hunch it was going to be good – you can’t really judge it by the quality of Epi’s regular Les Paul copies, since it is a completely different instrument. But I still wasn’t prepared for exactly how good it would be… It’s a 27.75″ scale Les Paul (yup, a full three inches longer than a regular LP…), with a mahogany body and carved maple top, stained brown with a matte satin finish. The set neck is maple – which hopefully will be a little sturdier than the more common mahogany necks – with a rosewood fretboard. The guitar is tuned B-B at the moment, and sounds absolutely gorgeous! A baritone is really a completely different instrument, compared to a regular scale guitar, so you need to re-evaluate your playing to figure out what sounds good and what doesn’t. But at the same time… at first, everything you play sounds dead cool! Since the guitar uses a combination of longer scale and thicker strings to get to the halfway house between the guitar and bass that it is, it has that ”piano” type of quality on the low strings. Anyone who has tried slapping thicker strings on a regular guitar and tuning it low (or who have tried a regular scale 7-string, for that matter) knows that rubbery feeling from the strings. This is exactly the opposite… I initially had it strung 14-18-26w-44w-56w-68w, which I really liked. I’ve since tried the Elixir Nanoweb Baritone set, but the gauges (12-16-22p-38w-52w-68w) and especially the plain third string feels a little too loose for me. Even so, this is a guitar I will use sparingly, and the long-lasting Elixirs work great for that, so for the moment they are staying on. The finish does have a couple of rough spots where a few dust speckles seems to have landed right before the satin finish dried, and the neck binding doesn’t feel 100% smooth all the way along the neck. But other than that, it is a very nice instrument. 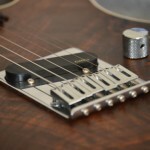 The Grover tuners do their job well, and work just fine without slipping or feeling overly sloppy. I was pleasantly surprised to find the control cavity painted with conductive paint, which extended up over the edge (to meet the foil on the inside of the control cavity cover) – a nice touch you sometimes won’t even find on guitars costing three times as much as this. Yes, I know these are supposed to be for girls. But I don’t care – it’s just such a cool guitar! I got this one from 4sound in Karlstad, when Harry made me an offer I couldn’t refuse (thanks!). Basically it is a 24.75″ scale 12-string guitar with mini-humbuckers. I would definitely have preferred a 25.5″ scale, to keep the strings (currently D’addario EXL150) a little more taut. But beggars can’t be choosers, so… Anyway, the string pairs are grouped together rather tightly, so if you have fat fingers you might not like it. 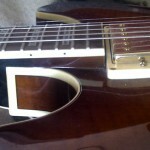 The tuners are from Grover, which helps a lot – tuning a 12-string can be a nightmare if the tuners aren’t up to the job. Obviously, the 12 tuners does make the guitar a bit neck-heavy when you wear it on a strap, but that comes with the territory, I suppose. I decided to check out the new Squier Classic Vibe guitars, and fell in love with this one on the spot. It plays just perfectly, and was dead cheap. Simply awesome – it takes me back to the early ’80s, when the JV Squires were far better instruments than their Fender counterparts. The Classic Vibe Telecaster and Stratocaster are just as good, so get them while they are still allowed to make them this good! I normally use the bass with my Fender Bassman head and a cab (I’m preferential to the EBS Classic Line 1×12″, which is sublime with the Bassman), and a small pedalboard (featuring a tuner, EBS MultiComp and Octabass pedals, and a DOD envelope filter) on the floor. I will occasionally also use a Stinkfoot SD-1 Bass Drive overdrive pedal, if I need more dirt. I’ve also gigged with the 11 Rack (the expansion pack contains an Ampeg model with 8×10″ cab), which works great too, assuming the PA is big enough to carry the low end. I immediately took the finger rest off the bass (I can’t see the point of having it in that position), and that’s the only mod I’ve done to it so far. Strings are GHS Boomers 045-105. I have added a clear pickguard, to tighten the distance between the top and the strings, while still keeping the rear-routed look. 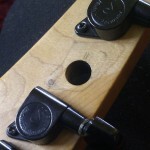 I will definitely also replace the output jack and jack plate – both are decidedly flimsy – and possibly also the tuners. The bass pictured isn’t mine – the headstock on mine is a little closer to the traditional Fender shape, but the rest of the bass looks just like the pic. Strings are EBS Titanium Nickel Classic Medium 5’s (45-128). This one has a solid cedar top, walnut purflings and rosewood back/sides/bridge. The neck is mahogany with a plain rosewood fingerboard. It also has an L.R. 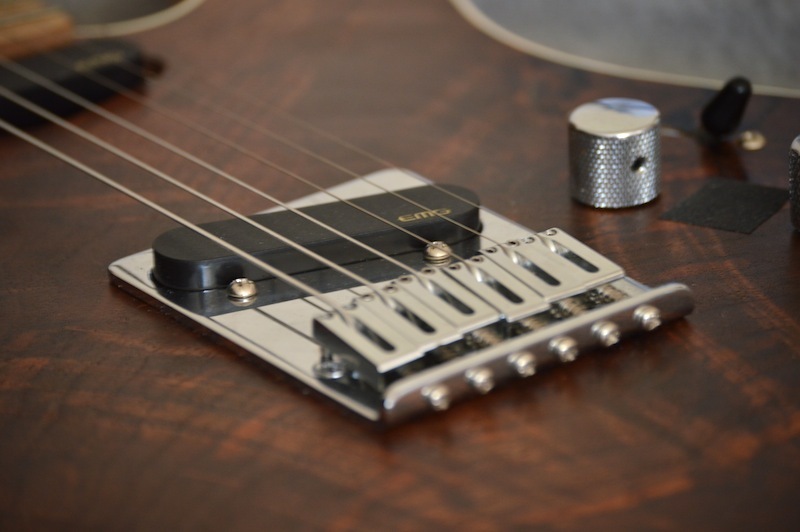 Baggs i-beam active pickup system – the most natural sounding pickup I’ve yet to hear. The only trouble is that the sound feels a smidge distant on the low strings. I suspect this isn’t the pickup’s fault, though – the Furch has a bridge plate that is easily three times as thick as normal (the bracings doesn’t go around it but straight across, and the areas in between are filled up with wood, to make up the bridge plate). This type of bridge plate/x-bracing design is part of the Furch sound, but it also increases the distance between the i-Beam pickup and the bridge. I suspect this is what causes the slightly lop-sided sound. I’m thinking about dropping the i-Beam altogether (installing it in the Seagull, where I suspect it will shine), and installing a UST/AST system from B-Band instead. Any pickup installed in this guitar will need a parametric eq for live work, as it can get quite lively around 200 Hz. Other than that, all the i-Beam needs it a smidge less top (2-3 dB less at 12kHz) to sound fabulous. In fact, the pickup sounds so good on its own I’ve actually used it to record direct. And together with the Baggs Para Acoustic DI, the sound is nothing short of spectacular! The small body makes it perfect for fingerpicking – the sound is very focused, and surprisingly big for its size. It has lots of the same qualities as a well played classical guitar – at least I hear it when my cousin plays it (as he knows how to properly play classical). Played with a pick, the sound is utterly crap. But stick to fingerpicking, and you will be rewarded. It records extremely well – before I bought the Grand, I found myself at times eq’ing the Furch to sound like this one. And again it’s a guitar on the cheaper end of the market that has caught me – the S-series are the most basic Seagulls around. But the features are all there: solid cedar top, wild cherry back+sides, maple neck with Indian rosewood fingerboard – what more do you want? 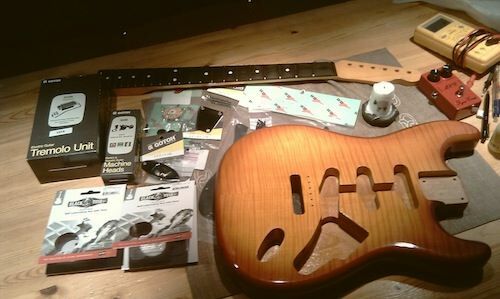 On a whim I came across a WD strat body with a flame maple top in honeyburst, and the race started… I quickly ordered a neck (telecaster, of course), Gotoh tuners and Gotoh/Wilkinson VS100 tremolo in Cosmo Black, black single layer pickguard etc. It may eventually become a ”nice” guitar (good for 2-piece suit gigs), with HSS pickup configuration, but I don’t know when that will happen.